Dan Flores' first thought on hearing he'd be heading home to South Texas: "When will I be able to tell my mother?" Second thought -- no doubt the fruit of four long Michigan winters -- "You'll never hear me complain of the heat." I accept this pastoral responsibility with profound gratitude to the Lord for his providence in bringing me back to beloved South Texas. From my youth my grandparents and my parents cultivated in me a great appreciation for the dignity and richness of the border communities of Texas. This appreciation lives in the deepest part of me. This border culture, particularly in the Rio Grande Valley, was forged by the movement of history and directed by the efforts of families struggling to create a worthy life for their loved ones. The border bears the marks of having a particular destiny, a mission at the service of human development and cultural exchange. The Lord calls us to give testimony that the encounter between distinct cultures does not necessarily imply a clash, nor does it imply that one has to lose his cultural identity upon entering into a new situation. By the providence of God, we can show forth a pathway toward the future marked by cultural respect, the exchange of gifts, and of authentic human solidarity. May God help us to attain this goal. The Church continues to offer the leaven of Christ to all who live in this region. Without this leaven, we cannot complete our mission. The leaven of Christ has its own proper dynamism, moving human hearts from the inside, to look for ties of peace and justice in the name of Christ., the Son of God who became a man so as to look for us as the elder brother of us all. The abundant love of Christ the Lord, shared with us from the Cross, urges us to a fraternal and unbreakable commitment to one another. Christ has been faithful in his love for us, and for this reason Catholics, and indeed all Christians, feel a strong call to labor for the good of all our brothers and sisters. Hasta que en el cielo descansamos. What is our mission? I think it is the same one the Church has had across the centuries: To announce Christ, so that all men and women might seek baptismal life in Him. (En Cristo bautizados.) We work, also, so that all might have the spiritual understanding and fervor of heart needed to receive Christ Jesus in the Holy Eucharist. In this way we can experience the Eucharist as a sharing with Christ in the commitment of love made by Him to the Father and to us. (Con su Sacrificio alimentados.) Nourished with the sacrifice of love, we try to live so that others might have life also. (A la vida nos entregamos.) This means we are at the service of one another; this service given for the life of others often requires a sacrifice, yet only in the generosity it calls forth do we encounter the beauty and joy of the Christian life. Finally, we walk together on the pilgrimage of life and history toward our heavenly homeland. (Hasta que en el cielo descansamos.) God calls us to an unimaginable glory, and we travel this pilgrimage of life together. We journey together with hope. We work so that no one grows too weary on this road we travel. If we leave behind anyone who might be discouraged on this road, if we do not make such a persons interests our very own, then Christ will not let us cross to the heaven he has prepared for us. We go together, or we do not go at all. "Our concern principally -- I think the voice of the bishops has been very clear on this across the country -- is that a just, fair immigration reform always protects families first.... It's really important that we take a push for this, because it's a matter of fundamental justice for families that the church has always worked for." 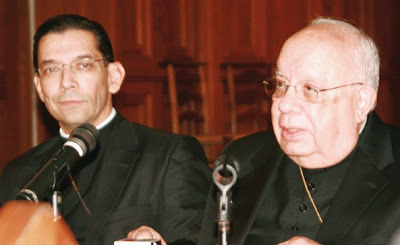 During a lull at last month's Baltimore plenary, one friend -- not seeing today's move in the cards -- buzzed with what felt like an inspired idea: given the impending vacancy of the Catholic University of America's top post, why not restore the bishops' academy's early tradition of a bishop-rector, and name Flores to the slot? "He'd be amazing," the thought closed. And no question, he would've been. Yet for all the its potential, the proposal missed one crucial thing: for a son of Texas, not even the pre-eminence of the capital and the pinnacle of Catholic education on these shores could ever begin to approach the comforts and joys of simply being home again. A challenging work awaits along the border, but an exciting one, too. Watch -- he'll be just as spectacular in Brownsville as he would've been in Brookland... yet what's more, given the youthfulness of his new charge, the work of forming a crucial segment of the church's future has still come Flores' way, just on a far more massive scale than any campus could fit. Indeed, what awaits is both a challenge and a joy... and he'll take to it as he always has: with a touch of class, a boatload of smarts... and most of all, simply, for the love of Him. "Dear Brothers and Sisters, We Are the City!"